These number cards 1-20 are a great addition to any math center! The numbers are in the center of each card with the suits in the upper left and lower right corners.. They’re great source of fun and learning. 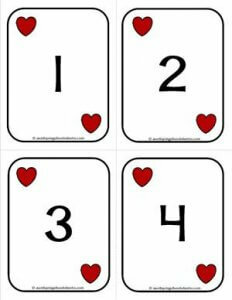 You can use them for math card games, sequencing, counting, comparing numbers, and more! It is recommended that you print these on card stock and laminate for longer lasting cards.